Okay, I have officially caved in! I put this off forever because I have been trying to take out as many extra elements in my life as possible, not ADD on! However, I thought this might actually be somewhat therapeutic for me and I do enjoy catching up on other's lives and family updates. Last Sunday I was released as the YW President in our ward after 2 1/2 years and feel like perhaps this might help to fill the void and give me something fun to do in my spare time...funny choice of words- "spare time". I think as mothers we never actually have "spare time", we just have to dig deep to create it for ourselves, though it tends to take the place of the millions of other things on our "to do" list, waiting to be fulfilled. I do believe this time to ourselves is crucial and can be justified as necessary "productive me time" rather than "selfish wasted time". By the way, can anyone explain to me why our picture is GINORMOUS?? I promise I had no vain intentions, I just have no idea how to format a blog! Hey Kristin! I am so proud of you! What great pictures! Thanks for sharing your thoughts on motherhood! You are a very sweet mother and sister! I am so glad that you have caved. I think you'll like it. I like your thoughts about spare time. I'm not sure why your picture is so big. I had the same problem with mine...but not so big. I'm not good at the special effects. Good luck figuring it out. Welcome to the Blog-world!!! I'm glad you joined in! I can't wait to keep updated on your cute family! hey Kristi Dist! WELCOME TO THE WONDERFUL WORLD OF BLOGGING! I'm thinking that you just need to resize your pic. I just took the original picture and sized it down for you. I will e-mail it over right now. Let me know if that works. I'm not a BLOGGER expert, but I could probably figure some of it out if you need any help with anything. I can also make you a little banner WITH your family pictures in Photoshop...if Blogger lets you do that. Just let me know! Can't wait to hear even MORE from the Nelson fam! YAY! Otherwise, "Smorgasmord" it is! LOL! K Kristi-Dist...got your picture resized and posted on your blog at the right size. It's still pretty big though and now you can't see the title really well. I will work on a new banner while you're teaching piano and pop it on later to surprise you....if you don't like it, we can totally put this pic back up!! LOVE YOU! Hi! Me again! Like all of my comments on your very first entry? LOL! So hi!!! 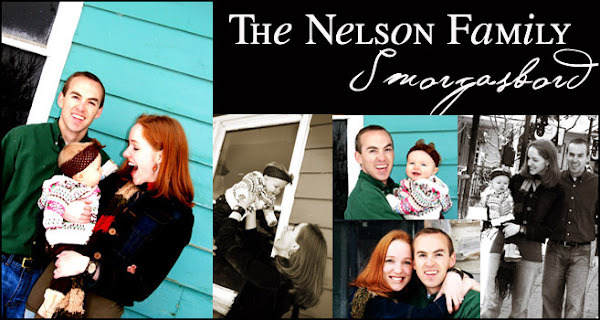 Just posted a NELSON FAMILY BANNER here on your blog......let me know if you like it. Remember, I don't get offended....ever. So if you want some changes...different pictures.....etc, etc, etc....EASY to do. Or if you don't like the fonts, we can change em up! LMK! LOVE YOU! HAPPY BLOGGING!